Phan Van Xung signs for his medication at the pharmacy. Image by Linh Pham for Communication for Development Ltd.
HFG’s overarching goal in Vietnam is to ensure the sustainability of HIV and AIDS services by supporting the country’s health financing activities. In a country of 93 million, an estimated 250,000 people are living with HIV(PLHIV) and about 100,000 are on antiretroviral treatment, according to Vietnam’s Ministry of Health (June 2015). 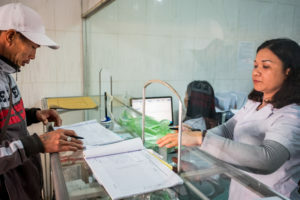 With donor funding expected to decline, it is critical for the Government of Vietnam to identify viable solutions for sustaining HIV and AIDS prevention, care, and treatment services. As acknowledged by the government and many stakeholders, Social Health Insurance (SHI) is the most appropriate long-term vehicle for Vietnam to take on the direct financial burden from HIV and AIDS programs. Increased domestic resource mobilization for procurement. Supports the Vietnam Administration of HIV and AIDS Control (VAAC), Department of Health Insurance, and Vietnam Social Security (VSS) in the integration of OPCs for eligibility for reimbursement by the health insurance fund. Supplies evidence-based data and strategic information to support key advocacy objectives towards increased domestic resource mobilization for HIV in Vietnam. HFG works with partners vested in strengthening the financing of the health system in Vietnam. Partners include: Vietnam’s Ministry of Health, Vietnam Social Security, USAID/Vietnam and other USAID-funded projects, the Social Affairs committee of the National Assembly, the Office of Government, the Health Strategy and Policy Institute, UNAIDS, WHO, and the World Bank.